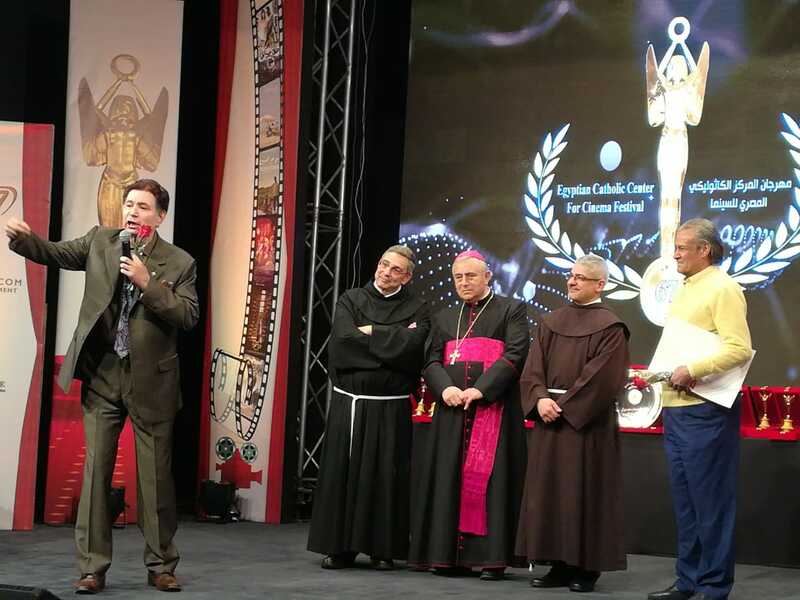 Downtown Cairo last week was the scene of an event held annually at the Cairo Catholic Centre premises, the Egyptian Catholic Centre Cinema Festival. Launched in 1952, the oldest film festival in Egypt aims to support filmmakimg that transects with human and and moral values. It is traditionally well attended by renowned figures in Egyptian cinema, and has over the years earned a reputation for being a respected, well-heeled, generous event on the Cairo film scene. This year’s festival runs from 8 to 15 February. 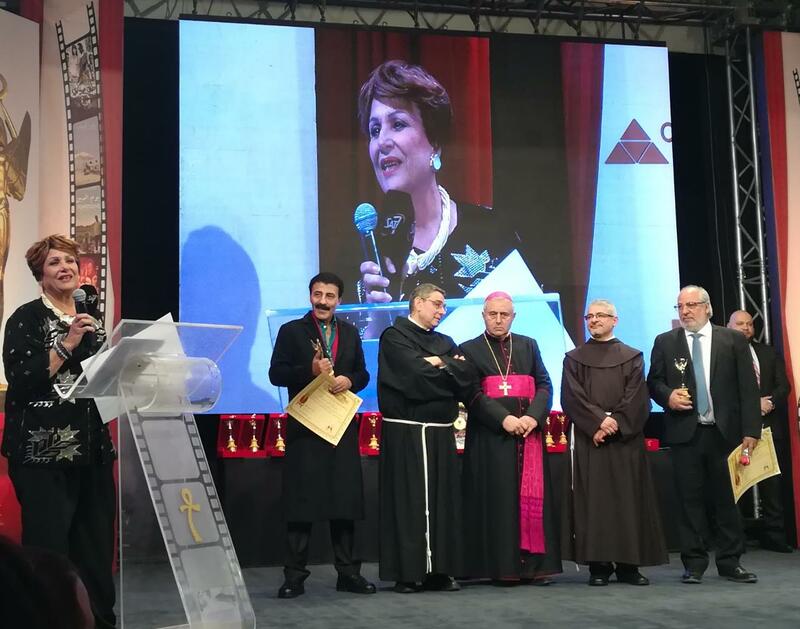 Gracing the opening ceremony was the Apostolic Nuncio to Egypt, Archbishop Bruno Muzarò. On hand was Father Boutros Danial, head of the Catholic Centre and the festival, and members of the Centre board Magdi Sami and Michel Maher. 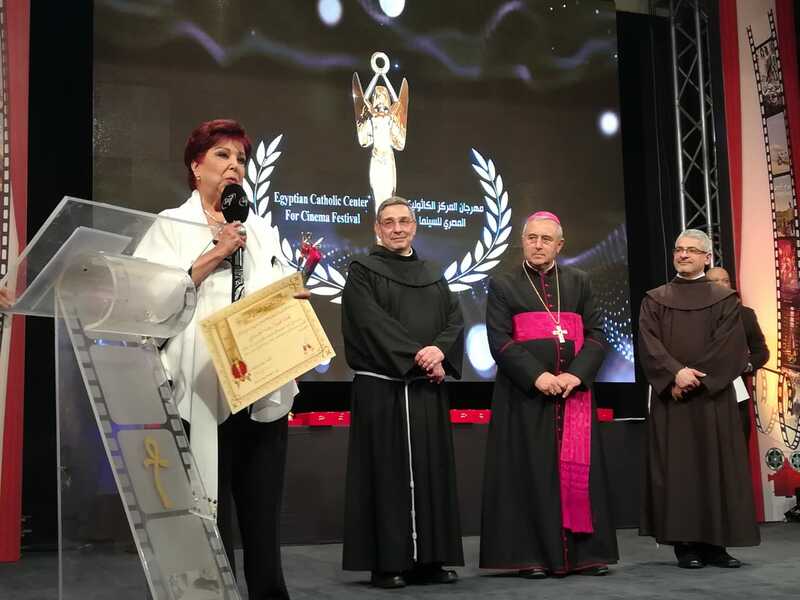 Fr Boutros announced that this year’s edition would be dedicated to the name of Gamil Ratib (1926 – 2018), one of the truly great figures on Egypt’s acting scene. Footage was screened that showed a medley of scenes from Ratib’s most famous films. Monsignor Muzarò gave a word in which he thanked Fr Boutros who, he said, had for years shouldered the responsibility of the Catholic Centre which was founded back in 1949. He also thanked all the actors and actresses and cinema figures who had shown up. 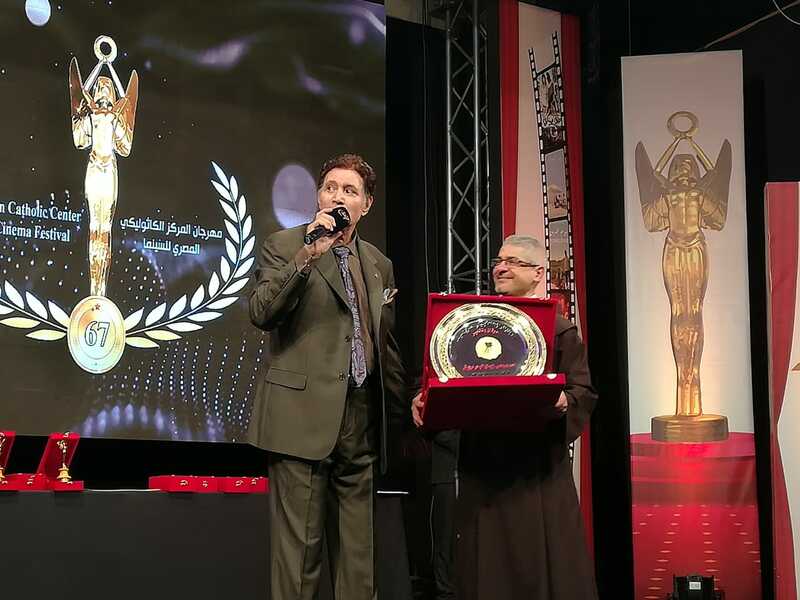 Together with Fr Boutros, Monsignor Muzarò honoured six figures with the Pioneer Award, for their lifelong contribution to Egyptian cinema. The first to be handed the award was veteran actor Farouq al-Fishawi who was honoured for “the promotion of distinguished works, and his varied artistic contribution”. Mr Fishawi joyfully received his award, describing the Catholic Centre as “very gracious”, and pointing out that this was the fifth prize given to him by the Centre. “It makes me very happy that the Centre honours my career, through which I tried to serve Egyptian culture and cinema,” he said. The star singer Iman al-Bahr Darwish went on stage and sang for Fishawi. The audience interacted enthusiastically with him. Darwish is the grandson of Sayed Darwish (1892 – 1923), a pioneer musician who innovated the use of Egyptian folk music elements in beautiful works that took Egypt by storm. Darwish is today considered to have worked a pivotal shift in Egyptian music by taking it back to its roots after decades of Ottoman influence. Egypt’s national anthem today is a piece that was composed by Darwish. 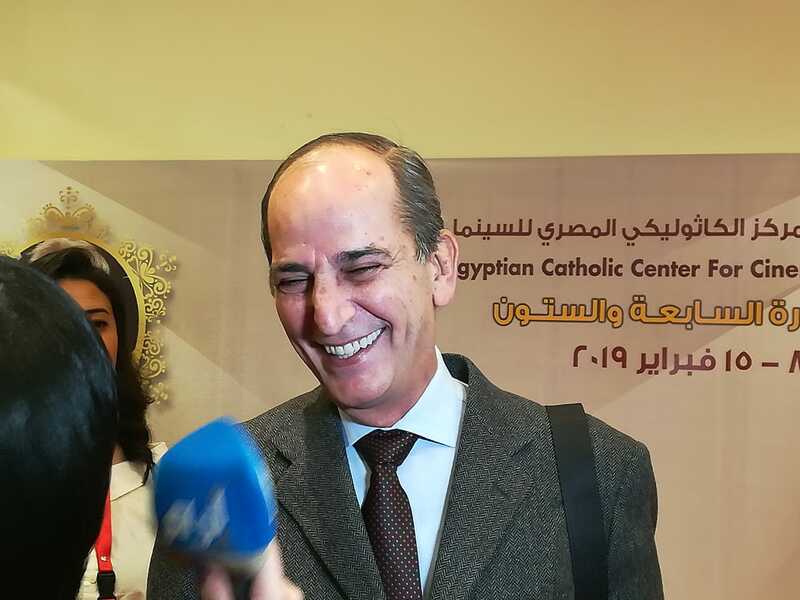 Before singing to Fishawi, Iman al-Bahr Darwish spoke warmly of the Catholic Centre and Fr Boutros who, he said, had almost daily called him when he fell ill some time ago. 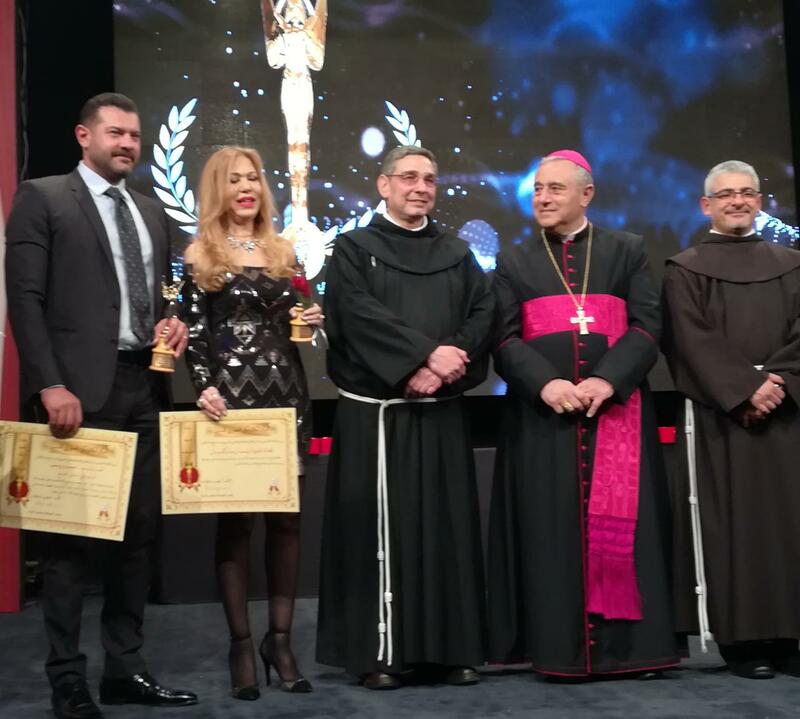 The Pioneer Award was also granted to the actresses Iman Sarkissian and Raghda, as well as actors Ahmad Bedeir and Hisham Selim. Ms Sarkissian, as slender and elegant as always, thanked the Catholic Centre for the honour. “Some honours are closer to the heart than others,” she said, “and this honour is very special.” She remembered warmly that Fr Boutros called constantly to offer comfort when she recently lost her mother. 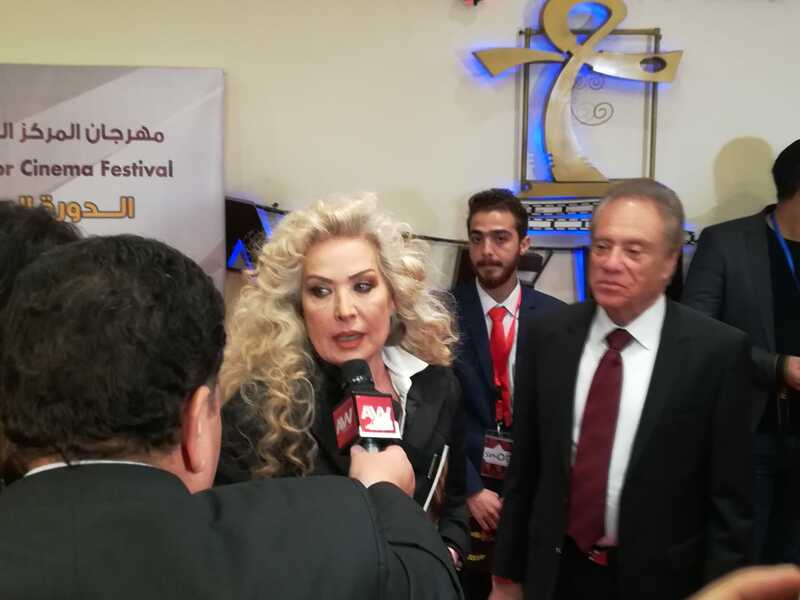 Mr Bedeir commented that it was especially gratifying to be honoured by the oldest film festival in Egypt. He dedicated his award to his wife, the artist Faten al-Koumi. 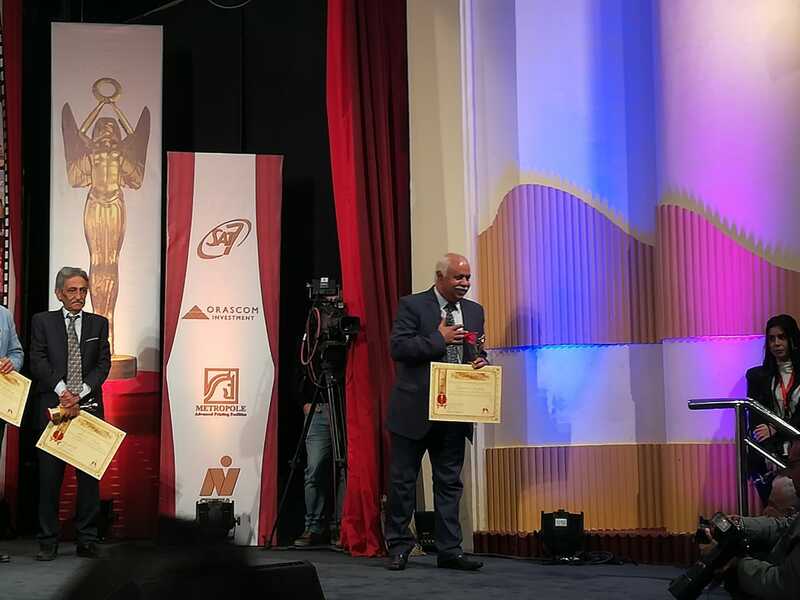 Photography directors Kamal Abdel-Aziz and Tareq al-Talmassani, as well as film editor Hussein Afifi and animation pioneer Shweikar Khalifa were also handed Artistic Creativity Awards. 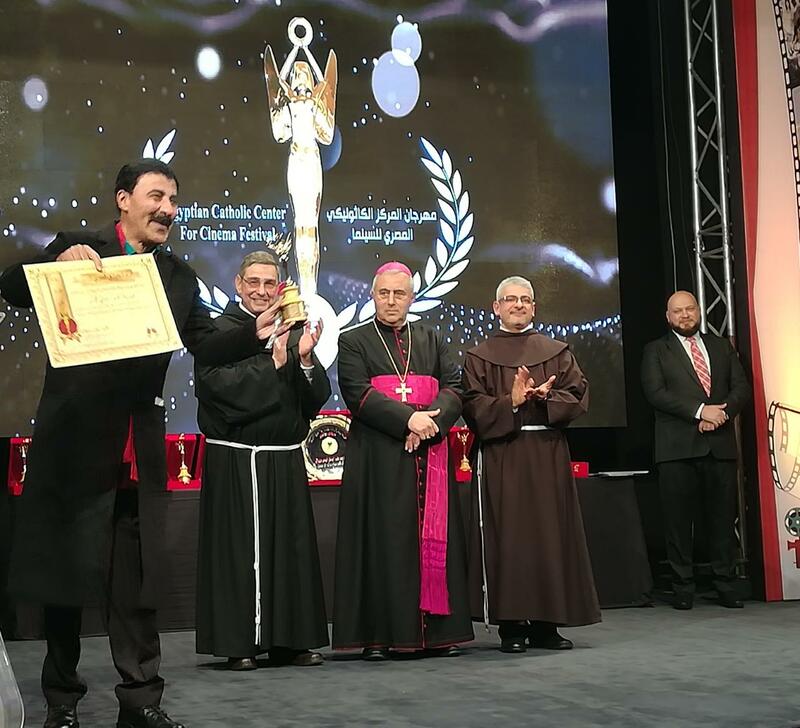 The Father Joseph Mazloum Award went to screenplay writer Karam al-Naggar who tearfully accepted it and dedicated it to his friend Gamil Rateb. 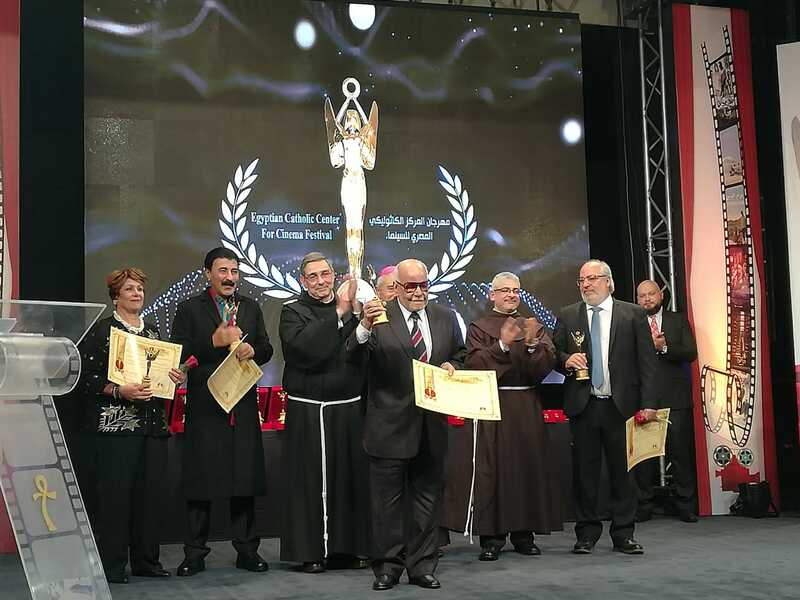 The Catholic Centre Festival Special Award was given to director Ahmed Yehia, whereas journalist and writer Hamdy Rizq was honoured with the Special Media Award for his enlightenment role and his involvement in humanitarian work. 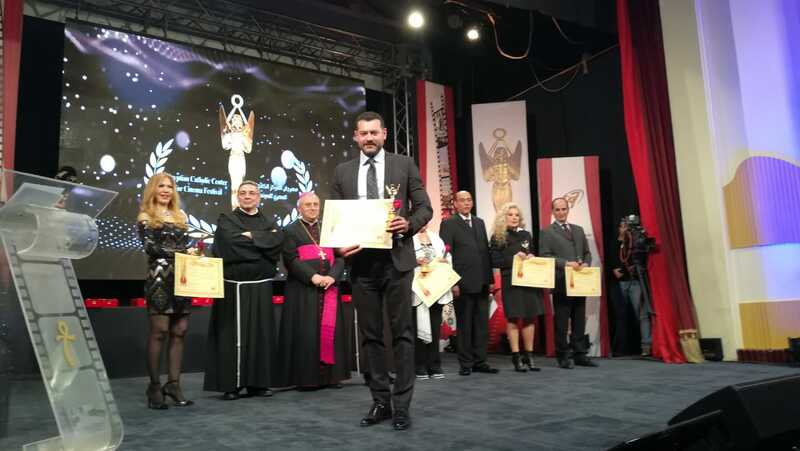 Iman al-Bahr Darwish was also given a special award, as were Saba Mubarak and Amr Youssef as best actress and actor for their roles in the TV series drama Taya, and the young actress Mai al-Ghiti for her role in the same series. The festival featured six films this year that were bound to win final awards: Yomeddine (Day of Judgment); Ward Masmoum (Poisoned Roses), Zahret al-Sabbar (Cactus Flower); Liel Kharigi (External Night); Eyar Nary (Gunshot) and Talq Sinaey (Induced Labour). 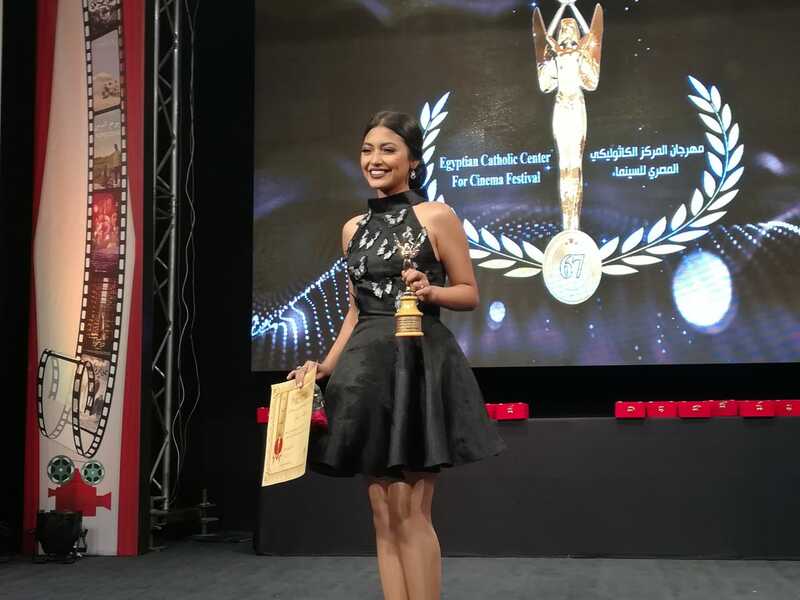 The jury included the actresses Elham Shaheen and Sabreen, actor Mustafa Shaaban, director Adel Adib, screenplay writer Muhammad Suleiman Abdel-Malek, musician Hisham Nazih and photography director Muhammad Mukhtar. Khaled Diab’s film Talq Sinaei (Induced Labour) won accolades from viewers. In a humane, comedic genre, the film depicts the bookseller Hussein, played by Maged Kidwani, and his wife Heba, played by Hurriya Farghali. With reading books at an all-time low, Hussein no longer makes ends meet. He worries about the future, especially given that his wife is pregnant. The couple decide it might be best to migrate to the US, a country that promises affluence, and start a new life there. But their application for a visa gets rejected. Hussein gets to know that embassies are ‘foreign soil’ that enjoy sovereignty of the country they belong to, so decides to get his wife to give birth at the US embassy in Cairo; that way his child would be born in the US, a US citizen. He decides to let her undergo induced labour so she could give birth there. In the meantime the couple get so offended at the high-and-mighty treatment they get at the hands of the embassy staff, and after a series of adventures decide that if this was the way America would treat them, they didn’t want to go. But a surprise is in store for them. Even though Heba does not undergo induced labour, she goes into labour at the embassy. She calls for her husband to rush her outside, but she is delivered of twins, one born in the embassy, and the other outside. 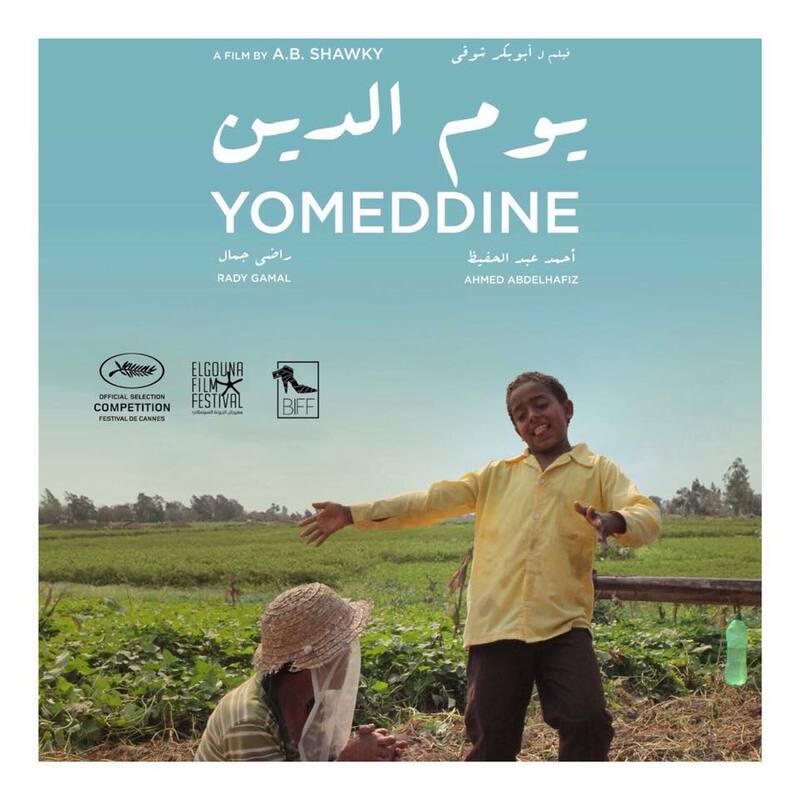 Another memorable film screened at the festival was Yomeddine, a first-time feature by director Abu-Bakr Shawky. It tells the story of Bishay, a Coptic leper who spent his life in the leper colony. He was cured but his wife, also a leper, dies. He then decides to leave the colony and go search for his roots and the father who had abandoned him. Accompanying him are the only friends he has: a Nubian child and a donkey. Bishay’s journey takes him into the past and future as well, exploring how society ostracises those who have his disease, and highlighting their suffering in the leper colony. The film is not only brilliant for its humanitarian message, but also in its execution as a riveting drama. Rady Gamal, who played Bishay, is a real-life recovered leper; Shawky insisted on having him play the lead role. 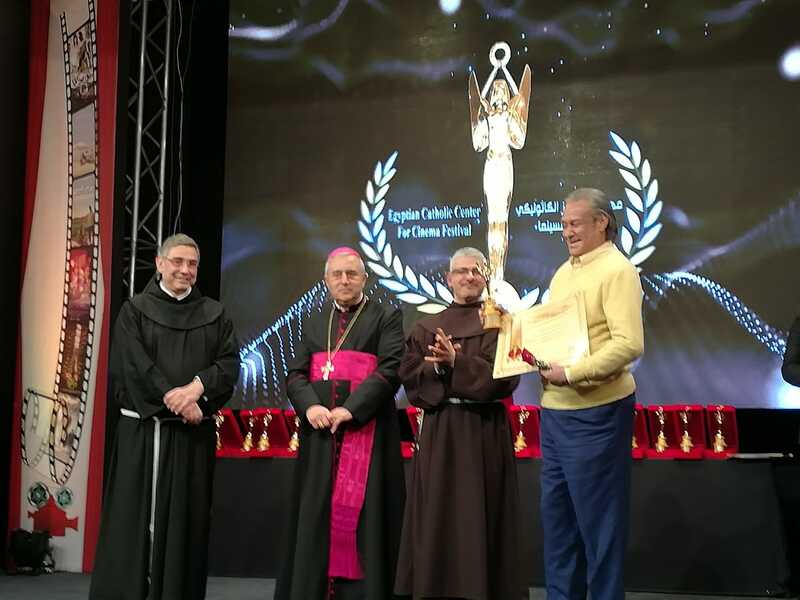 Yomeddine had won the Cinema for Humanity Audience Award by El Gouna Film Festival in 2018. Watani went to press before the festival’s finale and announcement of the winners. There can be no doubt the Catholic Centre Film Festival lived up to its reputation, bringing joy for all who attended it.